Optoma HD26 review | What Hi-Fi? 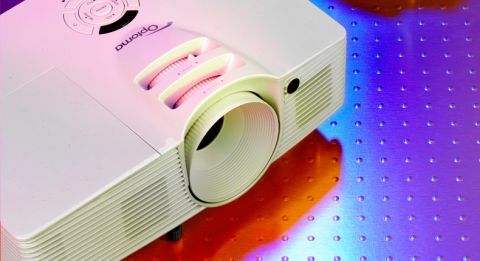 Finding a Full HD projector for £650 is no mean feat. Finding a great projector for £650, however, is even trickier. The compact Optoma HD26 seems like a good bargain on paper – 1080p and 3D support, twin HDMI inputs, large picture – but some may not be enamoured with its limited connectivity and less-than-subtle picture. Play Thor: The Dark World and the Optoma delivers a clean and lavish picture, but one in which the colours veer on the overblown side and blocks of colour have little shading or subtlety. The golden armour of the Asgardian army is richly detailed and inviting, but skin-tones could appear more natural. Detail is dished out with little subtlety, and there isn’t enough gradation in the contours of objects to give them realistic depth. It’s not the brightest picture, either, especially when compared with the Epson EH-TW5200 and BenQ W1070+. This helps black levels though, the dark cave scenes in Thor revelling in the appropriate level of gloom. Highlights appear muted, a fact that robs the picture of punch and excitement. The metallic gleam of Formula 1 cars in Rush is dulled down, while sunlit scenes don’t have the intense, warm brightness you’d expect. Motion isn’t the smoothest either, with faint judders present around moving objects. Upscaled content - such as material on DVD - takes an even greater hit, with the half-processed, blocky and noisy picture of Stoker proving difficult to watch. We’re not expecting the most insightful and lifelike picture at this budget price, but we’re still a little disappointed. On a positive note, the Optoma’s built-in speakers have a rich, weighty way with voices. It’s easy to follow dialogue, and voices don’t sound as tinny as they do on many rivals. Films in 3D are surprisingly easy on the eye with the HD26, even with active-shutter glasses on. There’s a decent level of depth, albeit not too dramatic. As expected the picture is a little dark though. Thankfully, the motion issues don’t worsen during fast-moving action scenes, such as in the Isle of Man TT race documentary Closer To The Edge. The 3D glasses are light, but they don’t grip securely. You’ll have to purchase them (£80 per pair) and an RF emitter (£10) separately too. Zoom, keystone correction and controls all feature on the projector itself and you can adjust the focus of the lens manually. The remote has a blindingly bright blue backlight, which is great for using in a dark cinema room (but may leave you with sunspots in your eyes). You only get two HDMI inputs on the HD26 – good news if you only have digital sources and want to keep things tidy, bad news if your sources are analogue. The digital focus continues with MHL support, meaning you can stream HD videos from a compatible smartphone. There is a 3.5mm audio output, but the limited connectivity might put some of you off. If the HD26 was notably cheaper than its rivals we would forgive its shortcomings. But there are price rivals out there, and many offer superior performance. We know you’ll find a better entry-level alternative elsewhere.